Last week was a very special week. I went to the Louis Vuitton store in Amsterdam at P.C. Hoofstraat to buy my very first LV bag. When I was 16 I got a little LV wallet from my mom for Christmas, but this is the real deal. I was on the hunt for a small cross body (but that could still fit a ton) for a while now. The Gucci Marmont bag was an option too, but the logo was just too 'out there' for me and I wanted something classic. The speedy with a strap (either size 25 or 30) came to mind as well, but I see those on the street so many times! Then it wasn't special anymore. I haven't seen the Alma BB anywhere and I love that I can wear it as a top handle too! The Damier Ebene has always been my favorite. 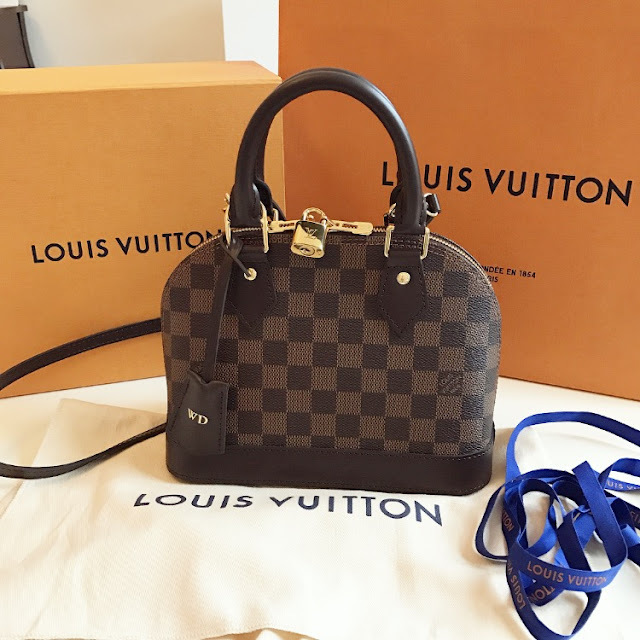 This is actually designed my Louis Vuitton himself whereas the LV monogram was designed by his son after his death. And also, the monogram is way too screwy for me. Don't like the beige leather either. So the Damier Ebene was an easy choice and for other options I had I watched a ton of Youtube videos. Loved watching 'what fits in my bag' videos on the Alma BB. And really, it's way bigger in real life! I had to wait for about 25 minutes (it was so busy) and somehow my Sales Associate knew it was my first LV bag. She sat down next to me for a little chat and brought in the Alma BB. I also tried on a Vernis leather color, but thought I would get sick of it after a while. On Youtube I heard to get a good SA because they're everything and that is so true! I absolutely adored mine. She got brought me Moët & Chandon champagne (my favorite!) and I just sat there at the same comfortable chair. She wrapped it beautifully for me, which is of course half the fun! Even payment was done while seated there! Loved how she rearranged the coffee table for me and even poured in more champagne so I could get the perfect instagram photo. She even downloaded Boomerang on my phone so we could make a cute video of her pouring champagne. I got my initials hot stamped which makes the bag look even more pretty if you'd ask me!! Wore the bag to high tea with my mom in Amsterdam on Saturday and wore it for dinner and drinks later that night with a girlfriend. Love that you can wear this bag from day to night. All in all it took about an hour (from the time it was my turn till I walked out the door) and just the whole experience is sooo great!! Looking at people that are there and to be treated like a royal and walking out the door with that big orange bag is just all an awesome experience. Most of the people like to travel from one part to another part. If you want to travel to Morocco then you can maintain your time to enjoy your vacations. There is aussiewritingreview in which you can find the proper zone for the health and safety. looks awesome.. thanks for blogging about this louis vuitton product information.